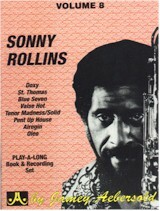 Volume 8, SONNY ROLLINS. Intermediate/advanced level. These tunes represent a large portion of the jazz player's vocabulary. They are all considered jazz standards. Songs range from simple to complex, slow tempos to fast. The chord changes on several tunes are such that the novice improviser can solo using a single scale such as the Blues or Pentatonic scale, yet intermediate and advanced players will still have plenty of challenge playing on the flowing and natural chord changes as they go by. Others present a greater challenge, with fast tempos, 3/4 time signatures and alternating grooves. Something for everyone. Rhythm section is Dan Haerle, piano; Rufus Reid, bass; Jonathan Higgins, drums. Titles: Doxy, Oleo, St. Thomas, Pent Up House, Blue Seven, Airegin, Valse Hot, Tenor Madness, Solid.